Recently, Eco Child’s Play editor Jennifer Lance wrote about the CPSIA that will go into effect on February 20, 2009, thus decimating the thousands of handmade mom and pop run businesses in this country. Without the ability to sell their toys, hair accessories, clothing, and shoes (yes, it’s not just toys! ), these families will be gravely affected – as will the many children and parents who have enjoyed these safe handmade toys and goods. In response to the pending act, parents, small business owners, and online websites have joined together as a means to have their voices heard and encourage government officials to make changes to the act before it puts so many folks out of business. If you’re wondering what you can do to help, and whether it’s going to take a chunk out of your day to get your message across, think again. Due to the increasing demand for information, Cool Mom Picks (my other gig) has put together a Save Handmade Resource Guide to help keep track of breaking news, resources and information, as well as blogs and websites who are writing about the CPSIA. Bookmark it, tell your friends and readers, and show your support by placing the button code (pictured) on your blog. 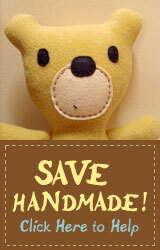 If you run a handmade business, alert your local news reporters! If you have other suggestions on how to get our voices heard, or you’ve written a post about this topic, make sure to leave your comments and links in the comment section. « Does Obesity and Diabetes Begin in the Womb?